Move aside Bo Jackson. Forget it Deion Sanders. Even Heather Moyse or Clara Hughes would envy this story. There’s been some famous crossover athletes in major sports, but Chestermere has one high school senior who is topping them all. Cadence Meszaros started the senior season making the Lakers volleyball team, helping them finish second in Rocky View and second in zones. From there, she moved over to the basketball team, and the Lakers had a great season, going undefeated in Rocky View, winning zones and finishing 13th in provincials. Then it was time for the badminton season, and Cadence got to team up with her younger brother Chazz to make the zone tournament in mixed doubles. At the time badminton was wrapping up, the rugby season got started and track practices were underway. For one week, there were three sports going at once, and Cadence proved she juggle it all. Growing up, the Meszaros family allowed their kids to try everything, and Cadence just kept going in many different areas, even outside the high school system. “All the sports I’ve tried, I ended up liking them,” Cadence said. “In hockey, I stopped because I was playing with guys and they were all bigger than me. I was a lot smaller than me and I didn’t want to get injured. “In lacrosse, I just couldn’t stick with it. The closest team is Strathmore. It was a good team. There was a lot of driving and I didn’t have the ability to commit to it. “I used to play club rugby in my Grade 9 year. I had bursitis in my knees, so I stopped playing although I really liked the sport. I decided to try again this year even though I know I’ve had past issues with my knees. “I do really like the sport. I’ve liked every sport I’ve tried and I try to stick with them, or at least come back to them if I can. This is her first foray into the high school rugby team, which she was able to do now that she’s not doing club basketball and volleyball like she did in the past. In track, she’s doing javelin and discus. At least now she’s able to drive herself to all these practices and games, which has eased the strain on her family. 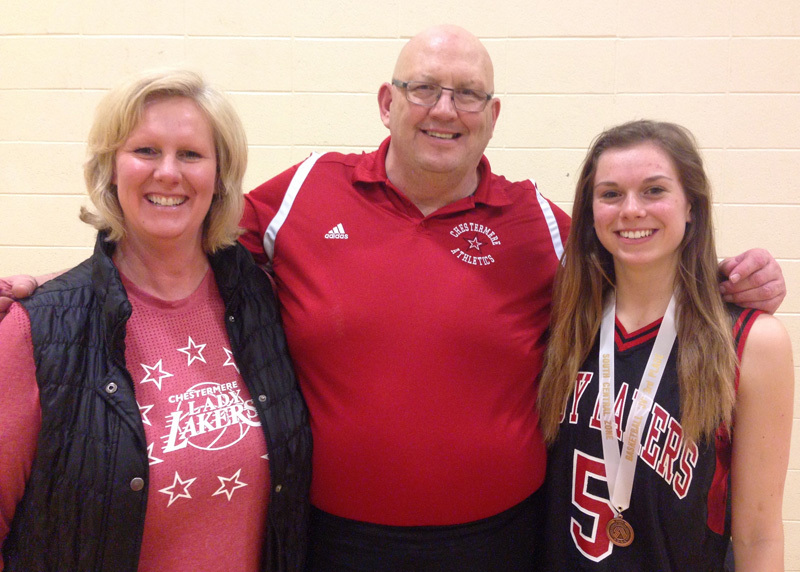 Cadence has followed in her mother’s footsteps in sports, as Beth Meszaros was a Lakers player in multiple sports too — although not as many as this 17-year-old. Beth feels a sense in pride that Cadence keeps going in all these sports and even other activities such as theatre and academics. You can give your children the opportunity to participate, but from there it’s up to them to take the ball and run with it. Cadence did that on her own, and her mother is excited just to be part of it. “She came out of the womb with a smile,” Beth said. “Her nickname in school was Smiley. She just has an amazing energy. “As a parent, you get that front-row seat. I love that. We get to share in all that excitement. Watching is great but the before and after conversations are great. After this season, Cadence isn’t sure what she will pursue as she gets ready to head off to the University of Lethbridge in search of an education degree. There is no varsity volleyball team there, and she would have liked to play at that level, but there’s no stopping her from participating in whatever comes up. Over the years, she’s been given the flexibility to play multiple sports at once because of the support of coaches and her family and friends. If there was one sport that made her chose that above all others, she probably wouldn’t have done it. The question she gets a lot is which one she likes best. It’s an impossible one to answer, like choosing your favourite child. “I like them all a lot. It’s different teams and different experiences. It’s hard to choose just one because they all give me so much,” said Cadence, who might have a tiny preference for team sports over individual ones. “With team sports, you have a lot of team bonding outside of practices. That takes a lot more time and it’s a lot more fun I find. Being on so many teams means Cadence has friends all over Chestermere High, and she finds that is a great skill she’s learned through athletics. Whenever she starts something new, she has to get to know her teammates and coaches. One of the reasons Cadence ended up in so many sports during high school was a connection through her mother. High school coach Brian Utley coached Beth during her varsity basketball career, and he was able to inspire Cadence to follow her athletic pursuits, even after a devastating broken ankle she suffered several years ago playing volleyball. “When I was in middle school, Mr. Utley was out at some of our games when we played against Chestermere, because I’m from Langdon,” Cadence said. “My mom pointed him out saying ‘That was my high school coach.’ I knew who he was before high school but didn’t know who he was personally. “I got to Grade 10 and I didn’t want to play basketball because I was still getting over the broken ankle. It wasn’t the best season for basketball, but since Utley was coaching I decided to try out because my mom was coached by him.